Limited Seating – Don’t Wait! Are You Ready to Promote? We can help! We offer real-world training, coaching, and materials for all law enforcement ranks that are unique, proven, and highly effective. If you want to be BETTER prepared than your competition, then prepare BETTER than your competition. We Provide the Tools to Help You Succeed! Let us help you prepare to be more confident, more competitive, and more effective in your Police Promotional Testing process. We are dedicated to help law enforcement professionals advance their own careers by helping them to be highly competitive in their promotional testing process. 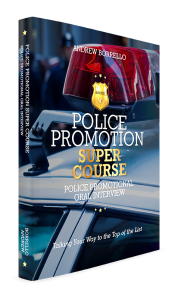 Captain Borrello’s book, POLICE PROMOTION SUPER COURSE, is unique in that it focuses on all aspects of the oral interview process and how to greatly improve your ability to deliver a dynamic presentation of your skills, abilities, and experience. 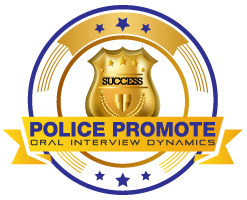 There are no books or materials that are as expansive and in-depth, covering the law enforcement promotional oral interview, in existence. The highly illustrative content provides the communication tools, techniques, and insider information that can greatly improve your chances of success. Through our different services and products, you’ll come away knowing that performing better means preparing better. You’ll learn HOW TO practice law enforcement interview questions and avoid common mistakes as well as how to keep the points once you’ve gotten them. As your confidence grows…your stress/anxiety over the oral interview process decreases. Understand what the panel members are looking for? Your panel members are looking for specifics about your law enforcement leadership skills and your character. They want a well-prepared leader and professional with diverse experience. The Oral Panel members will want candidates to have a broad view, able to see the big picture and to be able to demonstrate solid communication skills. Panel members will want you to assume the role you are testing for and clearly see that you are capable of good decisions, are disciplined, hardworking, loyal, and able to teach. Your interview question responses should be organized, detailed, conversational, and well spoken. Answers should be illustrative and descriptive, painting a picture for the panel members. Many of us lose points with minimal, topical, and cosmetic answers rather than emphasizing details and utilizing rich conversational language. It’s not just what you say (content), it’s how you say it (presentation). Learn how you must answer the oral interview questions for the position you are testing for, not the position you hold, assume the promoted officer role you are testing for. Remember delegation, discipline, evaluation adopting the role of stakeholder and risk manager. Develop a bird’s eye view and think organizationally. Embrace lifelong learning and seek to never stop growing or developing new skills. Learn simple techniques to make your communications dynamic? We will teach you to use and improve what you’re already good at to gain a distinct advantage. Learn to speak smoothly, directly, influentially and conversationally. You will learn to understand and master the techniques of verbal and physical communication. Remember the panel can only hear what you want them to hear, so you control the message, thus you control the score. Join the thousands of law enforcement professionals who have benefitted from our unique promotional resources! The training is intense, but fun and the book is included! Captain Borrello offers professional testing preparation for the oral interview. His small group consultations/coaching and seminars are unique in the industry and very effective. He provides intense, but fun learning, practice, and evaluation. In addition to his book, he offers a valuable PROMOTION RESOURCE GUIDE and professional resume service. Look through our services and products and learn more about what we have to offer. Only you are responsible for the development of your career and the advancement of your rank…we’ll make it easier!